3D technology is nothing new to medicine. For years, physicians have utilized ‘computerized tomography,’ known as CT scans, to create three-dimensional images of the human body. But now, 3D technology is moving being diagnosis to actual treatment through the use of 3D printing. And for patients suffering from the rare condition, tracheobronchomalacia, 3D printers can mean the difference between life and death, or should I say, life and breath. Patients with tracheobronchomalacia (TBM) are born with weak tracheas, that all-important passageway that funnels air to the lungs. The condition affects about one in 2,000 children and in extreme cases, the trachea collapses. As you can imagine, the prognosis for such patients is grim. Such was the case for Kaiba Gionfriddo, a beautiful boy born with brown curls, matching eyes, and the unfortunate condition, TBM. Fortunately for Kaiba, researchers from CS Mott Children’s Hospital, located on the sprawling campus of the University of Michigan in Ann Arbor, received approval to try out a new technology – 3D printing – to construct a splint that would support his weakened trachea until a time when it could support itself. They did this by customizing a flexible splint that fit around Kaiba’s trachea, providing support as he breathed, coughed, and sneezed. And most importantly, the devise was constructed of biomaterials that flexed to accommodate the rapid growth of an infant, and it will even eventually be resorbed by his body. Kaiba was only three months old when the device was implanted. He was one of three infants suffering from severe TBM to be fitted with the flexible splints. Dr. Glenn Green, an Associate Professor of Otolaryngology at the University of Michigan, led Kaiba’s case and is part of the team whose ground breaking technology appears in this month’s issue of the journal Science Translational Medicine. And tracheal splints are just the tip of the iceberg, as researchers continue to explore a growing partnership between 3D technology and medicine. The actual and potential uses of 3D printing in medicine include building customized prosthetics and implants, pharmaceutical research and drug delivery, and the fabrication of tissues and organs. 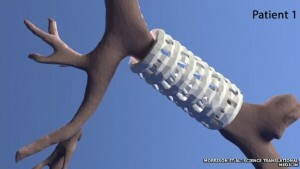 As for the tracheal splints, they can be designed to fit the unique dimensions of each patient, constructed of biomaterials that accommodate growth and dissolve over time, and can even be produced onsite using 3D printing wherever patients in need may be. The medical applications of 3D printing are limitless.